Happy Friday! Have you seen the news on Taylor's Blog about the search for some new members of the Sketch Crew? If you're interested in being considered be sure to check out the deets and get a card submitted! It's time to introduce you to Our Friday Friend. 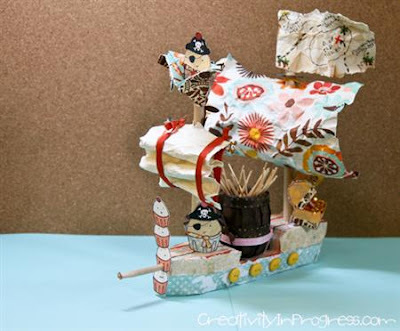 When we saw her pirate ship creation, we were blown away so we asked her to create a sample for today's TESC86 also. Please welcome Sunghee! You can see more views of her cuppie pirate ship in her blog post as well as get info on how she created it. In the meantime, let's learn a little about Sunghee. McLean, VA. It's very close to Washington D.C.
I’ve always adored paper crafting, but the real addiction started in spring2008. I attended a Stampin’ Up! make-n-take for the first time, and I was hooked. I’ve been stamping about a year and a half. Silly and colorful. I do a lot of Mini albums, and 3-D projects like favorboxes. But I LOVE working with my kids’ goofy, I mean cute photos the most. I love all Cuppies! They are so addictive! I put 3-4 scoops of Vanilla ice cream AND chocolate syrup in my coffeeevery morning. No wonder my coffee is always cold, hmmm. But, it’s sooooyummy~! 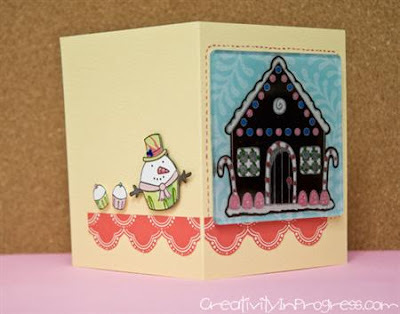 Learn more about Sunghee's sketch sample on her blog Creativity in Progress. Thank you Sunghee for being Our Friday Friend! What about you? Would you like to be Our Friday Friend? All you have to do is upload your creations featuring Taylored Expressions stamps to your gallery at SplitCoastStampers and remember to use our keyword tayloredexpressions (NO SPACE) to be considered. Congratulations Sunghee!!! Your pirate ship is absolutely STUNNING!!! I'd love just a tiny fraction of your creativity because I can't even begin to imagine how you thought of this!!! It's really really REALLY OUT OF THIS WORLD AMAZING!!! And your card is so creative too, with the way the scene wraps around the fold. Well done!!! How totally imaginative and wonderful is that pirate ship...i just want to take it off the page and put it in my bathtub! I don't dare let my 11 year old see it or it will be a "can you make that mom?" To which I answer "no way in ___ could I figure that one out!" BRILLIANT!! !